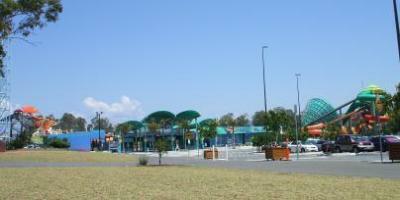 There are 6 major Queensland theme parks on the Gold Coast and a number of smaller themed parks. Every year around 10 million tourists visit the Gold Coast area of Queensland. It's one of Australia's biggest tourist destinations with its glorious weather, beautiful beaches, exciting nightlife, sporting facilities and attractions and holiday Queensland theme parks. For our purposes here we will cover the 6 biggest and most popular parks and suggest some of the rides or attractions we've tried and enjoyed. First up we're off to Dreamworld. This is a huge Queensland theme park that spans approximately 30 hectares and features a wide range of rides, shows and attractions. The Claw which will propel you 9 stories up and spin you at breakneck speed. The Wipeout where you will twist and tumble on the wildest wave in Australia. These are 4 of the big 8 and they're totally exhilarating and adrenalin pumping (or terrifying) depending on how adventurous you are. Flowrider - the perfect combination ride if you're into surfing, skateboarding or body-boarding. 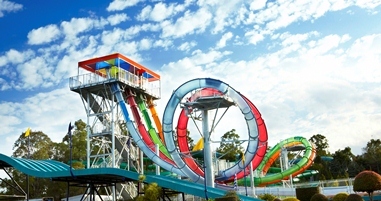 WhiteWater World is right next door to Dreamworld and together they form the biggest combined theme parks in Australia with around forty five rides and attractions. Now, WhiteWater World is a water park filled with cutting edge technology and wild attractions like you've never seen before! The Bro or Blue Ringed Octopus - a huge water slide with specially designed sled mats where riders speed head first at around 50 kilometres per hour, zipping around 270 degree turns for the thrill of a lifetime. Don't do this if you have a weak heart..... it's off the Geiger counter. The Green Room is a massive 1.5 million dollar funnel of fun that will give the most hardened of thrill seekers the chills. Warner Bros. Movie World is one of the Queensland theme parks on the Gold Coast and is a world of fantasy and fun where you can meet your favourite stars and super-heroes and experience the exhilaration of world-class adventure rides, movie attractions and an array of stunning shows. 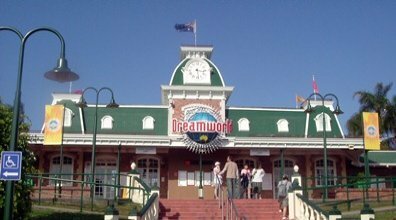 Movie World, like Dreamworld, offers a combination of great family entertainment and exhilarating rides as well. Arkhum Asylum a mixture of a breath-taking ride with infamous baddies from the movies including The Joker, Harley Quinn and Killer Crock. Exciting and funny at the same time! 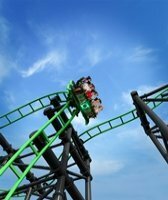 Green Lantern Roller Coaster which has the steepest inverted drop in the whole Southern Hemisphere, and it really will take your breath away. Batwing Space Shot where it's straight up - then straight down again - real fast. 4D Experience of 'Ice Age Dawn of the Dinosaurs' with Manny, Ellie and Diego along with Sid the Sloth as they stumble into a strange, subterranean world. Top class show for the whole family. And the All Star Parade where you can see all your most beloved Warner Brothers characters, from Scooby-Doo and the gang to Bugs Bunny and all the rest of the Looney Tunes favourites! 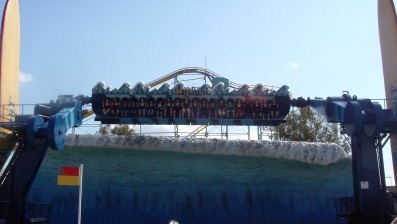 Not to be outdone, Sea World has been a family favourite Queensland theme park for over 35 years and is more than exciting rides, attractions and shows. It is also firmly committed to marine research and rescue, and a place where visitors can learn about and make contact with a variety of marine animals. Once again a wonderful encounter for the whole family. Jet Rescue where you hop on your Jet Ski and streak around the astonishing track, twisting and turning at an invigorating 70km per hour. Simple but lots of laughs and exciting. Try the Viking's Revenge Flume Ride. This is a leisurely Viking boat ride arriving at the 'battlements of the castle' - for a good old fashioned splash down. Also a great way to start your visit is the Sea World Monorail which takes you around the entire park letting you see where everything is and you can plan your day. Or try the more leisurely Sky High Skyway. Shark Bay where you can get up close to one of man's most feared predators. See these big sharks along with stingrays and exotic tropical fish, both above and below water. Also visit SpongeBob ParadePants, where you can meet all your favourite sea sponge friends including SpongeBob, Patrick Star and the Bikini Bottom dwellers in a stunning underwater parade. 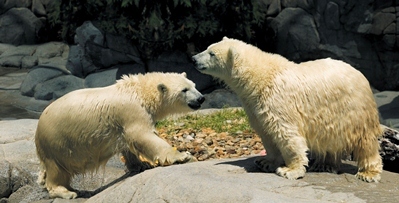 And the Polar Bear Shores, home to Australia's only captive Polar Bears, the largest land carnivores on the planet. 'Dora's Best Friend's Adventure Show' with Dora the explorer trying to find her best friend Boots. 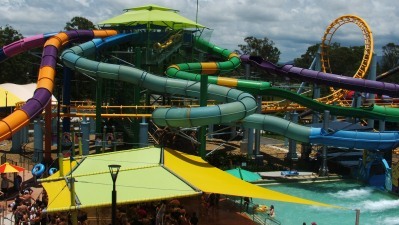 Wet'n'Wild Water World is where slides and rides are the big attraction! They claim the latest in fun filled slides, leisure pools and a shaded twenty acre subtropical garden. The H20 Zone and 'The Tornado', a Mad 'n' Massive thrill where your shot down a 40 meter tunnel right into the storm, then spun wildly while getting tossed about in the crazy, swirling surge. This is electrifying stuff! Then go for the Kamikaze, a giant U-shaped slide where you'll plunge 11 meters down one side, near-vertical and when you reach the bottom, you zoom up the opposite side, only to drop and do it again. The Blackhole is not for the faint hearted! This ride has two tube slides that spin riders around in spirals of pitch blackness. You can't tell which way is up and can't see anything until you blast through to splash down. It's totally fearsome! Mind you not every ride and slide an Wet'n'Wild is at breakneck speed, there's lots of calmer and less hectic rides that the family can enjoy. Try Whirlpool Springs, the cold spas that give you the opportunity to chill out and cool off. 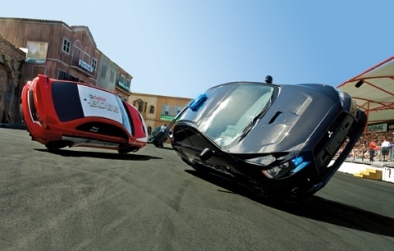 And the Surfrider, which lets you experience what it's like to plummet 30 meters down the face of a wave while spinning on a giant surfboard. So whether you're into the action of the Extreme H20 Zone, relaxing in a heated pool or having fun with the kids at Buccaneer Bay, there's something for everyone at Wet'n'Wild. Finally we visit Currumbin Wildlife Sanctuary, one of the Queensland theme parks with a difference; an oasis in the centre of the Gold Coast. 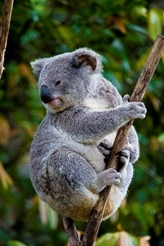 This 27 hectare landscaped sanctuary and surrounding bushland houses more than 1400 mammals, birds and reptiles. This is a really unique experience. Here you can see rare native animals in their natural habitat. 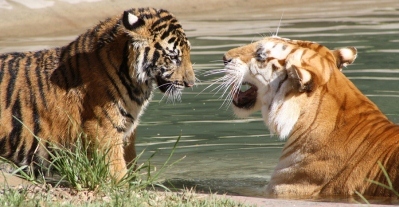 In fact the sanctuary is recognised internationally as a quality research and conservation facility. We visited Currumbin just recently and here's what we loved most of all. Have your photo taken with a cuddly koala and take home a unique souvenir of your day. 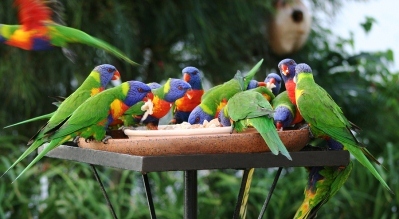 The Lorikeet Feeding is amazing with hundreds and hundreds of birds coming in to feed and all screeching at the top of their voices. WOW! Because the lorikeets are a wild population, sometimes you'll see some, sometimes you'll see hundreds (which we were lucky enough to catch) but you'll always be seeing one of the Gold Coast's most interesting natural phenomena. Another fascinating presentation is the wombat and koala feeding. Wombats and koalas are among Australia's most interesting marsupials and you'll discover plenty about them in this fascinating presentation. And an absolute must, the Aboriginal Dancers. The rich heritage of Aboriginal culture is celebrated each day with this Aboriginal Dance Show, featuring dances and stories from local tribes and the distinctive rhythm of the didgeridoo. The show offers Australians and international guests the chance to understand more about the ancient stories of the Dreamtime. 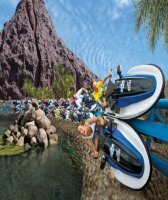 There are a number of smaller and equally exciting and interesting Queensland theme parks and if you have time you may wish to look them up and spend some time there also. 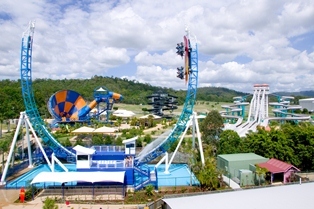 Just finally, spending a day or days at these Queensland theme parks can be quite expensive but the good news is that there are all sorts of offers available when you buy or purchase various passes; just give it a search before you head off. Some of the Queensland theme parks have even teamed together so you can buy passes which will give you entry into 3 or 4 parks and similarly you can purchase a pass which will give you entry and unlimited rides etc.